Prior to the propagation of cranberries, one of Middleborough’s principal fruit crops had been the wild huckleberry. While huckleberries may never have proved a crop of enormous commercial value for Middleborough, their role in the social history of the community is, nonetheless, noteworthy, and recorded references to huckleberrying are frequent in the period preceding the First World War. 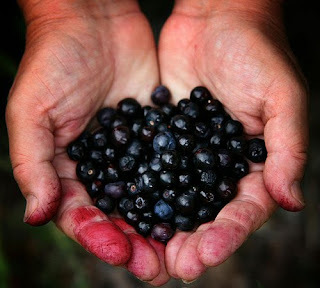 The wild huckleberry was noted in the earliest written accounts of the region made by European explorers. About 1602, Captain John Smith had described nearby Cape Cod as “overgrown with shrubby pines, hirts [huckleberries], and such trash.” Areas closer to Middleborough were likewise marked for their “considerable undergrowth of vines, huckleberry bushes and other shrubby plants.” Huckleberries thrived in both the swamps and uplands of South Middleborough, particularly, and they grew there in such abundance that they gave their name to nearby Huckleberry Corner in Carver near the end of Pine Street, where residents would sell their berries to the occupants of passing stages en route to New Bedford. Local residents would make their way into the woods each summer in search of the berry, and so great was their allure, that in August, 1879, a 90-year old woman is recorded as having "filled in some spare time this summer by picking a goodly quantity of huckleberries." Attempts were made at Middleborough, as elsewhere, to commercially exploit this natural bounty and, in July, 1885, an unnamed South Middleborough man was in fact shipping several crates of huckleberries a week to Nantucket, reportedly “doing a good business … and realizing good prices.” However, because the huckleberry plant was wild and had yet been domesticated, harvests were highly dependent upon the vagaries of nature. In November, 1902, it was reported that “South Middleborough bushes have become so twisted as to the season that they have been blossoming.” On October 25, 1913, the Gazette reporter was shown a cluster of ripe huckleberries and blossoms on the same branch by Elmer Hatch who just previously had been able to harvest enough berries for a pie. In 1919, South Middleborough residents were surprised to find ripe huckleberries as early as June. "Wild Berries", photograph by Stefan Klopp, August 8, 2008. Used under a Creative Commons license. Some rights reserved. 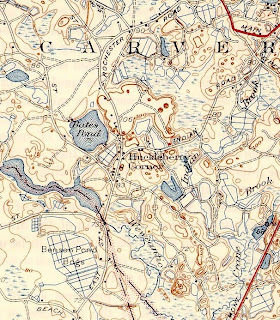 The map shows the location of Huckleberry Corner in Carver just up East Street from Middleborough and the Weweantic River. Residents from nearby South Middleborough likely were among those selling huckleberries here to passing stages, a practice which gave the neighborhood its name. 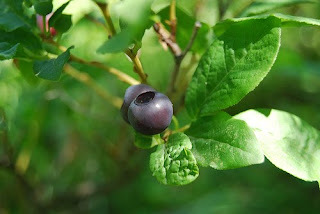 "Huckleberry Bush", photograph by farmerjulie, July 5, 2007. Used under a Creative Commons license. Some rights reserved. 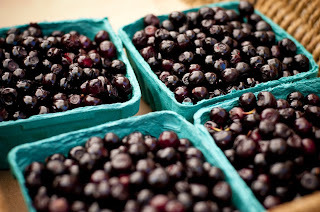 "Huckleberries", photograph by Geoffrey Smith, September 13, 2009. Used under a Creative Commons license. Some rights reserved. "I Think of Middleboro All the Time"